When gobbledygook becomes understandable and dreaming of my knitting “one day when”…..
As I’ve mentioned a few times before, I’m not a particularly good or confident knitter, generally I find crocheting far easier, it seems so much simpler to un-ravel crochet and find my place again with a hook, than when I’m knitting…in the past there have been tears and a feeling of fraughtness, wanting to give up as I just can’t understand what the stitches are trying to do (or what I’ve done wrong)…. 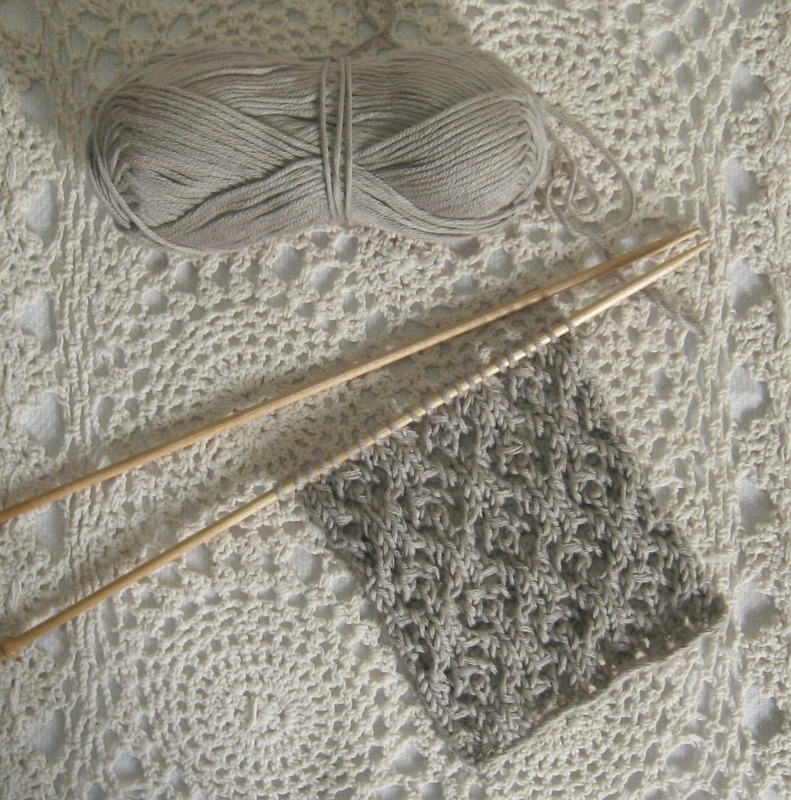 Some of my favourite blogs are by knitters, and when it all goes wrong and I’m un-ravelling yet again, I find myself looking at what they are creating, ….I never feel downcast or despondent by seeing some of the marvellous things they are knitting up, instead I feel inspired to try again, even if it’s just knitting a dishcloth. However, like with all things, to get better involves practice and so I’ve been trying to knit for an hour or so each day. Some years ago I bought a really nice book called “450 Knitting Stitches volume 2” (though it’s called volume 2, it’s the first volume covering a range of different stitches such as texture, cable and lace) and while I think this is a very helpful collection, it mentions stitches which I didn’t have the faintest how to knit. I think volume 1 which explains techniques and stitches is out of print however I was able to pick up second hand the bumper sized “Harmony Guide to Knitting as a Creative Craft” (this is the first three volumes all in one big fat book)……I won’t say there’s been no stopping me but it certainly has helped me understand a bit better what I’m meant to do. 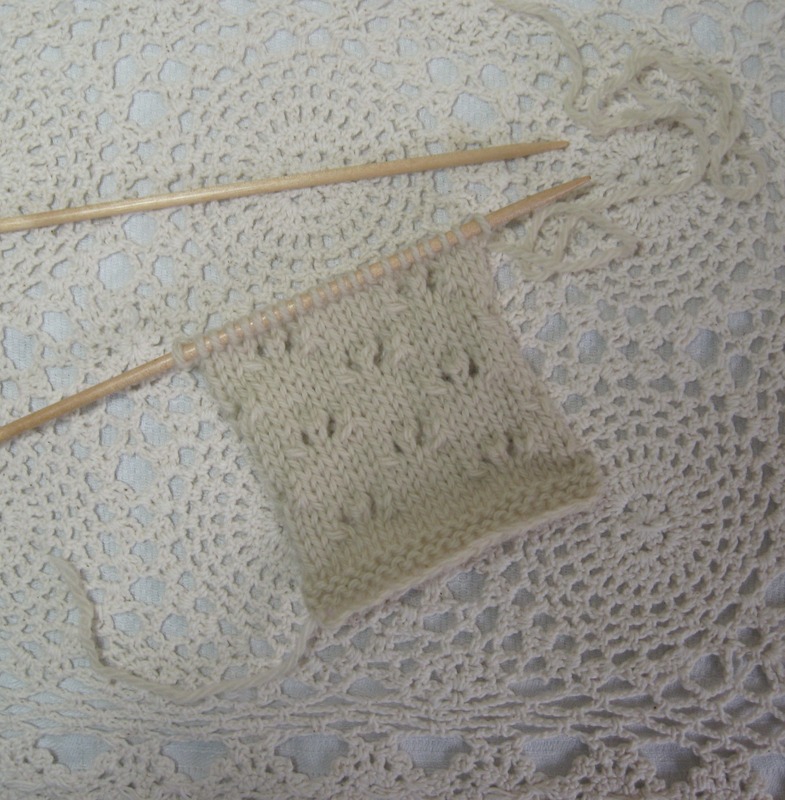 I find it easier to write out the pattern (in the knitting code) in my own hand writing as I seem to understand what the pattern is telling me to do better that way. Lots of little pieces of paper are dotted about around the sofa where I’ve noted where I am in the pattern, what line I’m on….. So I’ve been practicing, making little samples and swatches of different patterns that take my fancy. There’s two projects I’m trying to keep in mind, the first one is for a doily or decorative cloth for one of my sisters, I’d made her a dishcloth with the heart pattern in the centre and she’s decided it’s too pretty to be cleaning dishes and pans, and instead has it in her bedroom with a trinket box on top…I’ve told her to please use it and have promised to make her something a bit prettier for a bedroom. And the second project involves this lovely Artesano wool I bought last year from my local knitting shop and I’d really like to use it to knit a scarf…(okay, ideally I’d like to knit it up into a big shawl but I think that’s a bit beyond me for now so will be happy with a scarf) I can sort of see it in my head, I’m thinking of something with a lacy pattern (though not too complicated as I’d like to wear it this year). 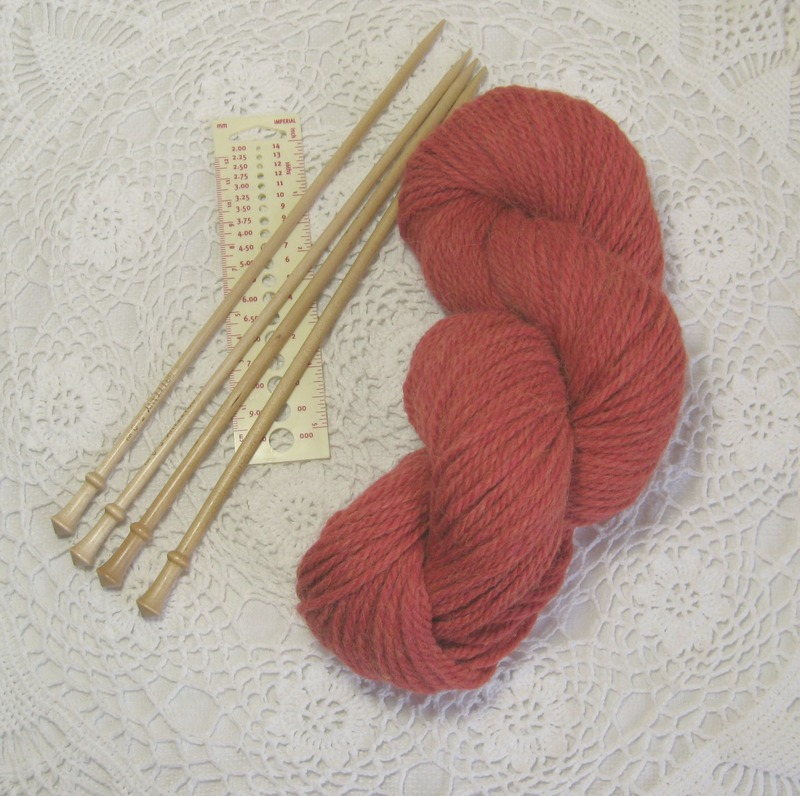 Alongside the wool are some of my Brittnay knitting needles…I love these so much. They look beautiful and just feel so perfectly at home in my hands. A few years ago I got very spoilt with a knitting shop voucher from my boyfriend’s parents and as it was a biggish birthday I really wanted to get something that would last and would be a nice keepsake so I bought a whole load of these knitting needles…I haven’t yet knitted anything to make the needles really proud or to do them justice, but I love holding them, and must admit to sometimes just sitting and imagining myself knitting wonderful things on them…..okay this is a good example of how daft I am..even before I can even knit properly I am worrying about knitting with circular needles, I hate metal needles (they make my fingers go cold very quickly) and the only wooden ones I’ve seen have been all swirly coloured, and even though I love colour,colour.colour, that swirly pattern gives me a headache. I’ve seen them in shops and look at them and sigh…I feel like the king and the marmalade who only wants a little bit of butter for his bread…I only want a plain coloured wooden needle…. 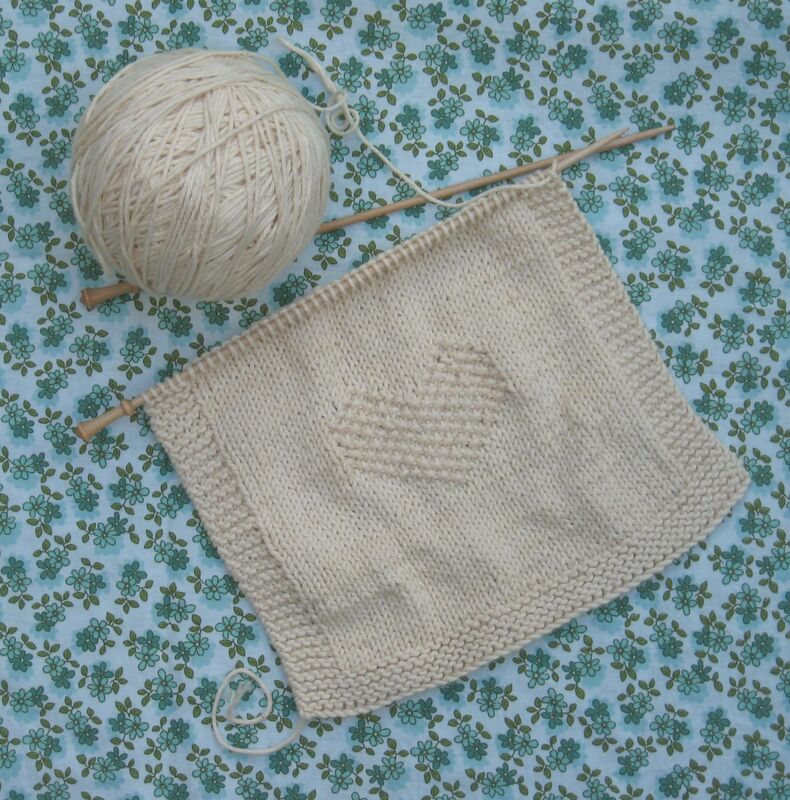 This is the first of my samplers/swatches….this is called a “chevron rib” and I’ve knitted it using a linen yarn by Rowan (I bought it some time ago when John Lewis had a sale)….I really liked this pattern but felt it was a bit too loose and lacy for either of the projects. The yarn itself feels lovely and light once it’s knitted, however I found it quite hard to knit, maybe I’m a bit of a tight knitter as my needles kept poking through the yarn and I kept finding myself with more stitches on my needles than the pattern was saying I should have…..so there was a fair bit of un-ravelling and starting again. At one point when the stitches were all wrong, I made the not to be repeated mistake of leaving it on the sofa while I made a pot of tea only to return to find Bernard had taken it upon himself to correct the mistake by un-ravelling it all. (He’d only beaten me to it so I couldn’t be too cross). This one is called “eyelet panes” and is pretty close to what I’m thinking of for my scarf, it’s not too lacy and it feels nice and squishy. 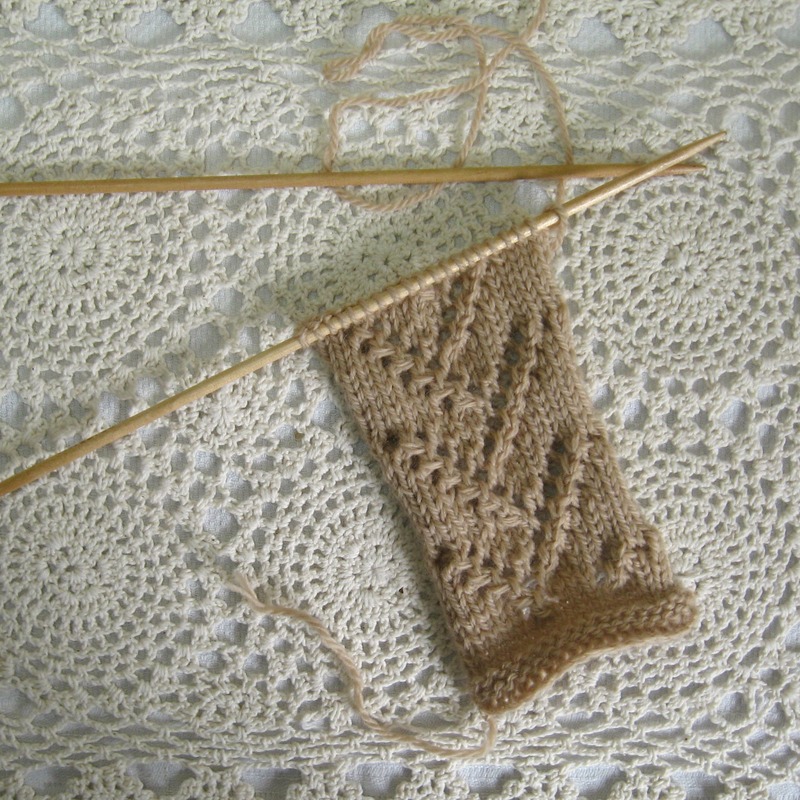 It’s another Rowan linen yarn and again I found it a bit hard to knit but I think it’s just me. 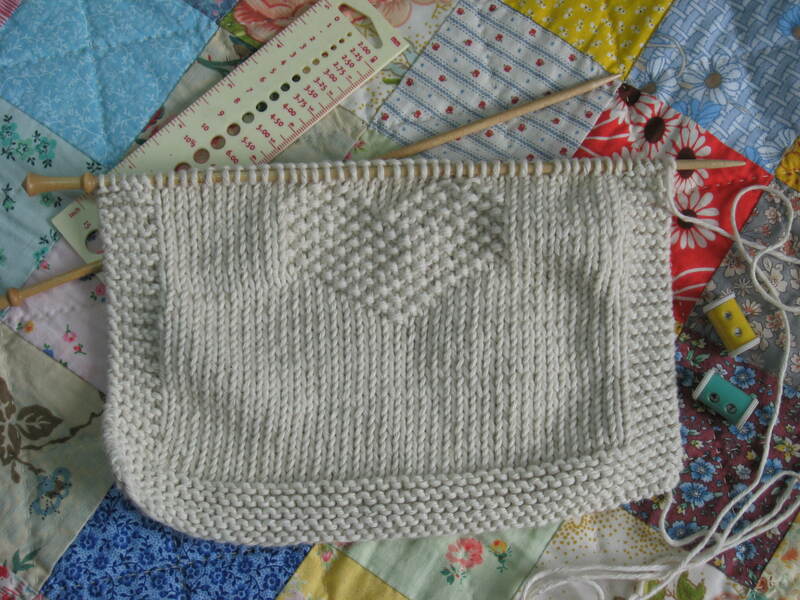 The pattern isn’t too pretty from the back so I’m trying out a few more swatchy testers before I start the scarf. I like the names of the different stitches (I can’t help but think about the blocks I’m making for “dear ethel”) and was trying at first to look for stitches that had the most appealing names (not the most sensible way to chose a stitch) however I’m finding the ones that involve leaf and seed names (the scarf being for Autumn I wanted the stitches to be Autumny sounding) more than a bit tricksy. I changed from the linen to an organic wool by Rowan (another John Lewis sale purchase I’d ferreted away in a cupboard for sometime never)….and used a slightly larger needle…this stitch is called “all-over eyelets” and while it’s not what I want for my scarf I ‘m thinking it may be more suitable for my sister’s doily. I think I’ll have to get the graph paper out and have a bit of a play around as I think it would look nice with a textured border. The pattern itself is nice and flat which is good if it is going to be used to put things on. 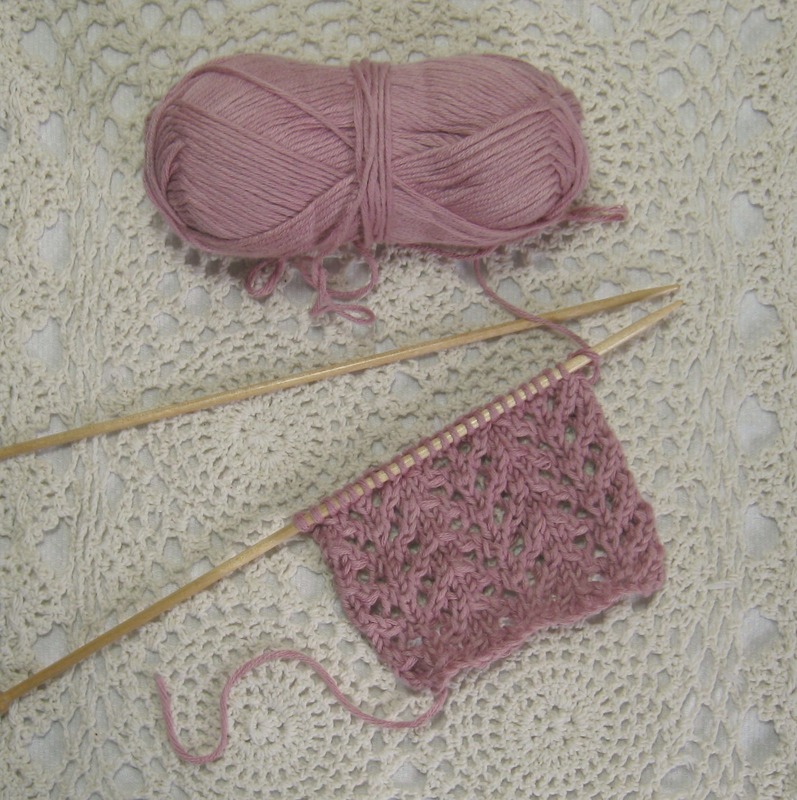 I tried it in linen and was nearly pulling my hair out…then switched over to the wool and only one un-ravel later…such happiness. The pattern is called “eyelet twigs” and I did have to un-knit one piece quite early on as I hadn’t yarn overed or something I was meant to have done (slowly and carefully each stitch taken back, to where I counted more than saw where I’d gone wrong) but then I was able to knit three repeats of the twelve line pattern…..I still want to laugh as I was so pleased I managed this. There was such a wonderful moment a week or so ago when I was looking at the knitting book and suddenly, I could understand some of what the pattern was telling me to do…the gobbledygook of a few weeks earlier was making sense….and while I still need to keep checking if I’m yarn overing or should I be knitting stitches in the back or front the fog slowly seems to be lifting. So while I’m still dreaming of the “one day when” and I’m able to show a cardigan or something proper fancy as a work in progress on my needles, these are the places I go to when the needles slip and fall off or aren’t passed over when they’re meant to….places of inspiration all. Kate Davies…Kate’s blog is always a treat and if you look there at the moment you can read all about the wool she’s had made…the colours are stunning. Ella Gordon….I was lucky enough to commission a couple of pairs of Ella’s gloves in the Spring…beautifully warm and lovely to look at…she’s also got the most envy inducing collection of Shetland knits. Felicity Ford (Knitsonik)…if I ever can get my head around fairisle knititng and how certain colour plays work or not then it will all be thanks to this totally amazing lady and her awesome Stranded Colourwork Sourcebook…her Knitsonik blog is always brilliant to read and she also writes at The Domestic Soundscape. Ysolda Teague…..Ysolda’s patterns are so beautiful, full of interesting details and her shawls…well I just love them all. Tom of Holland.….Hours can go by so quickly when I’m reading Tom’s blog, lots of beautiful pictures of proper old fashioned darning and wonderful writing about caring for our clothing. Stephen West (Westknits)…to be fair I probably look at Westknits instagram more than the blog, and his youtube is wonderful….because “boom…you’re in Paris!”……also his shawls are just incredible. 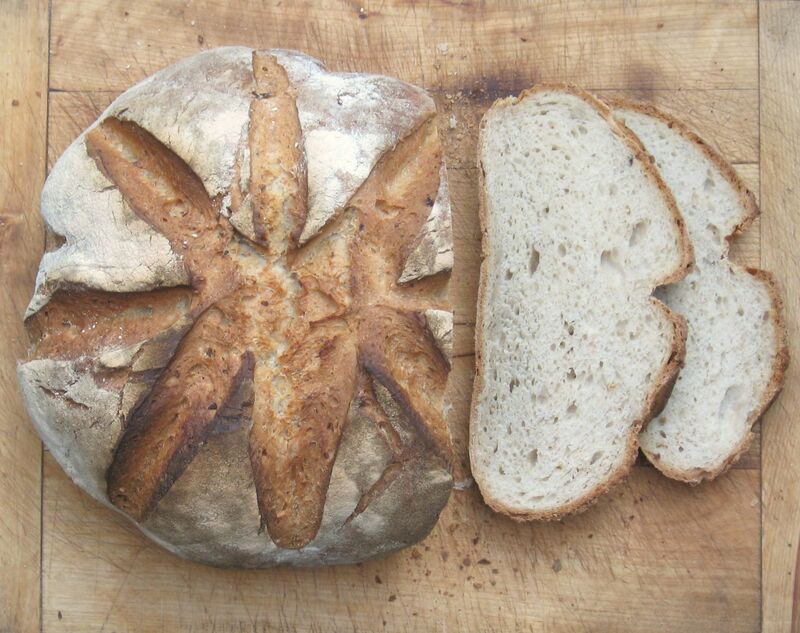 Foraging while a sourdough starter bubbles and dreaming of the Prince of Wales jumper….. The last few days I seem to have spent either all my time in the middle of a hedge getting stung to high heaven by the most pernicious nettles or in the kitten baking bread and making jellies. While the weather is fine I’m getting out before the fruit spoils and generally as long as I’ve gotten up early I can prepare the starter for bread so I can juggle baking and foraging quite happily. This is the latest bread, I’m finding scoring the dough with a star helps it to rise more evenly (it also has the bonus of looking pretty). 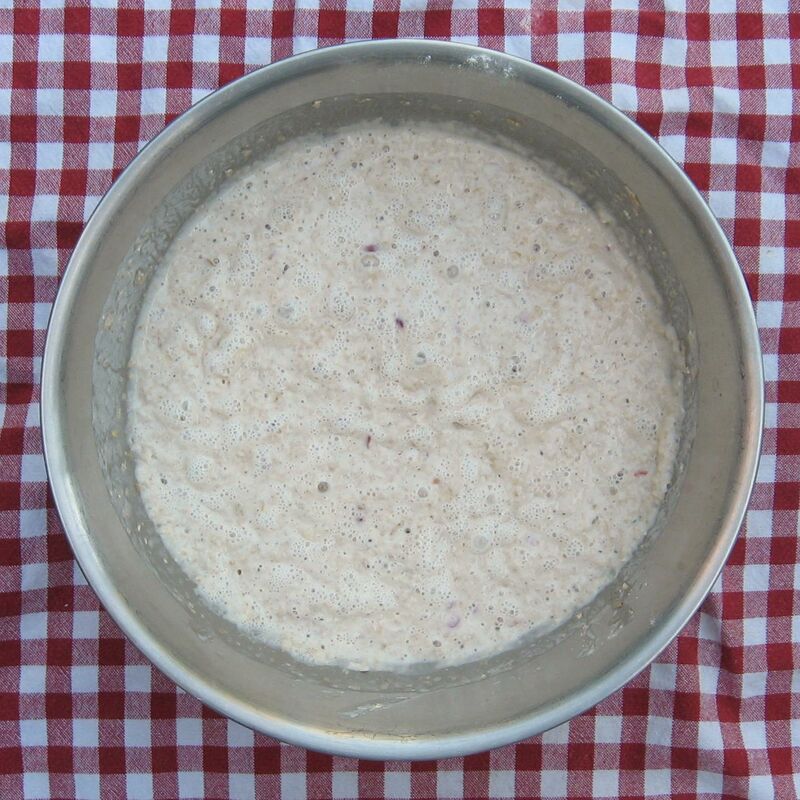 I keep my starter in the bottom of the fridge, and tend to take it out a couple of hours before I use it so it has a chance to come up to room temperature. then I add a small teaspoon of dry yeast as I find this makes for a better crumb and although I know this means I’m not making a proper sourdough, I don’t think the bread police are going to come round and take the bread away…my boyfriend likes it this way and as far as I’m concerned that’s what counts. After those ingredients have been mixed, I’ll cover the bowl with a cloth and just leave it to bubble away and do it’s thing. Over time I’ve experimented a bit and have found it likes being left alone…this is when I can go out with my basket and forage. Once the starter has bubbled up nicely and has become a sponge (I’ll have left it between 2 and 3 hours so can get on with other things) I add other ingredients to make the bread dough. I used to just throw in a handful of seeds but I’ve since read that it’s better if you grind them, you can absorb more from the seeds if they are broken down. 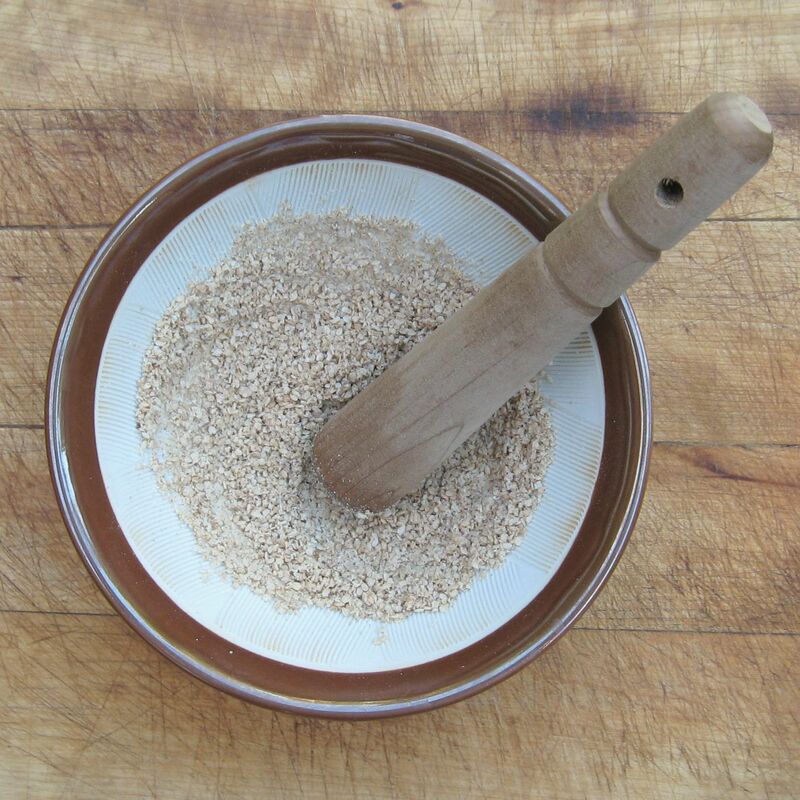 I bought a sesame seed grinder some years ago from a local health food store and it doesn’t take long for the seeds to break down against the ridges on the inside of the bowl, and become like a thick flour. Sesame and sunflower are the seeds I tend to add the most. Then I just add a handful of flour, a good pinch of sea salt, and a glug of oil, and just begin working the sponge into a dough, adding more flour while it’s so sticky, first off with a spatula and then once the dough comes together then it’s turned out on a work surface where I’ll knead it til it feels ready. It all sounds like a palaver as I can start the sponge around 9 or 10 o’clock in the morning and not take the finished loaf out the oven til sometime 8.30 in the evening but it’s actually very easy and relaxing to make, and I quite like planning out my time on a bread day. 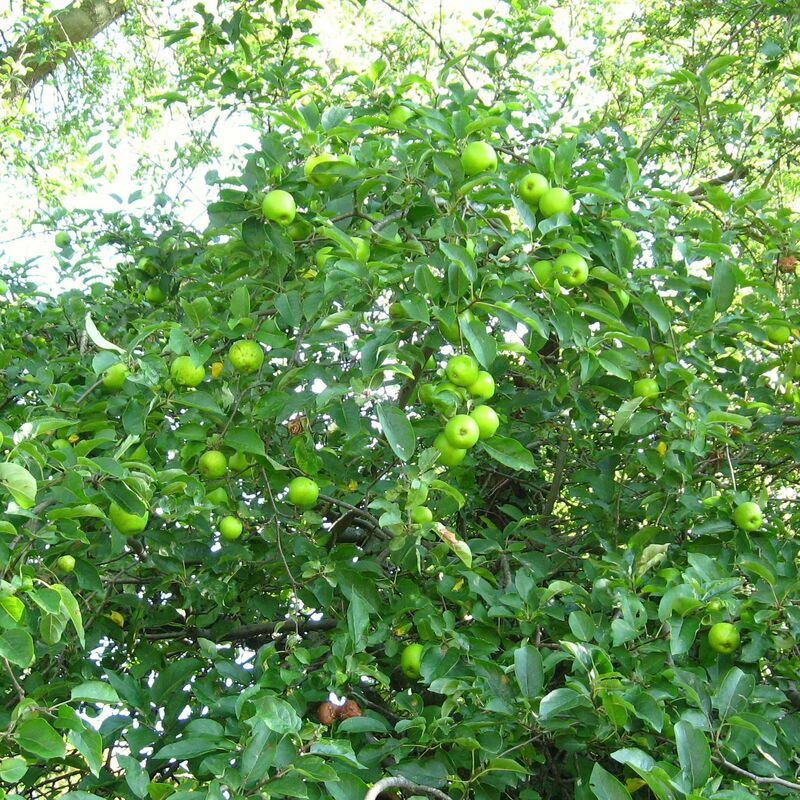 All around the village where we live are hedgerows which are scattered with crab apples and wildlings, this tree is just near the local school and with the assistance of an old crocked walking stick I bought the other year from a charity shop, I was able to reach the higher branches where the bigger sized apples were to be found. They’re a bit tart for eating as is, but I’m thinking to slice one with a bramley for a crumble for his pudding tomorrow (the weather is meant to be rotten so I’m thinking a hot pudding will be appreciated.) The tree was surrounded by fierce little nettles and my ankles are still all tingley some days later. 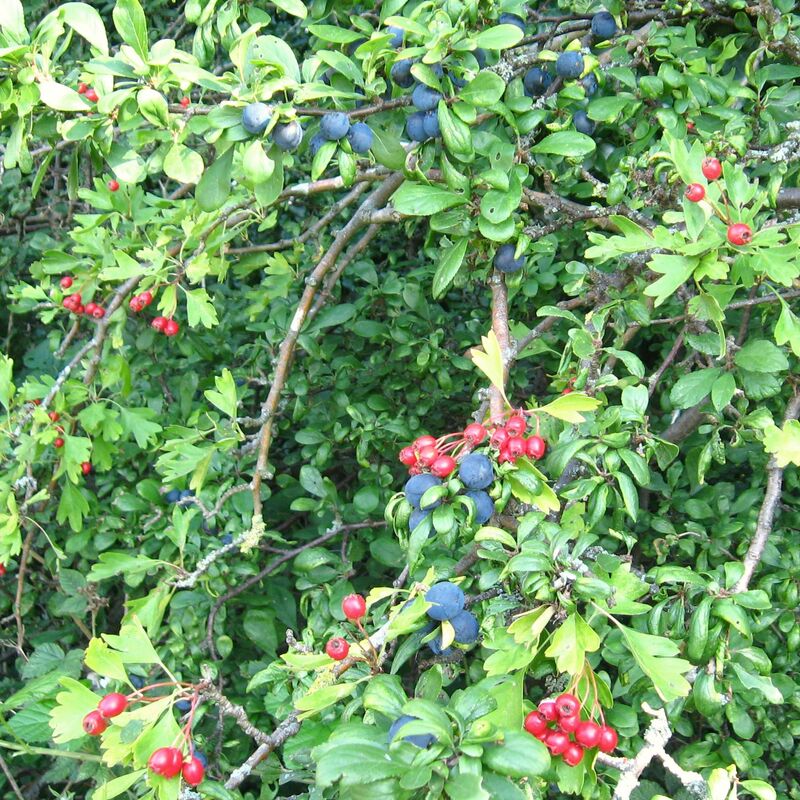 And just under the wildling is everything else you need for a hedgerow jam, fat purple sloes and red haws. The haws tend to be more suitable for a savory jelly, or fruit cheese to have alongside cheese or cold cuts , however as they’re full of pectin, a couple of handfuls thrown in amongst other berries will help a jam to set. I read a brilliant piece by Alys Fowler a while back about using them in a ketchup and I’m quite tempted as the hedgerows around here are just full of bright red haws. We also have a fair few guelder rose trees out on the marshes but I know well enough to leave those alone. When we were out the other weekend picking blackberries we saw a squirrel guarding his guelder rose tree, he really chittered down at us while he held the biggest cluster of berries between his little hands. It’s a combination of garter stitch and stockingette stitch with a little heart motif in the centre made with moss stitch. 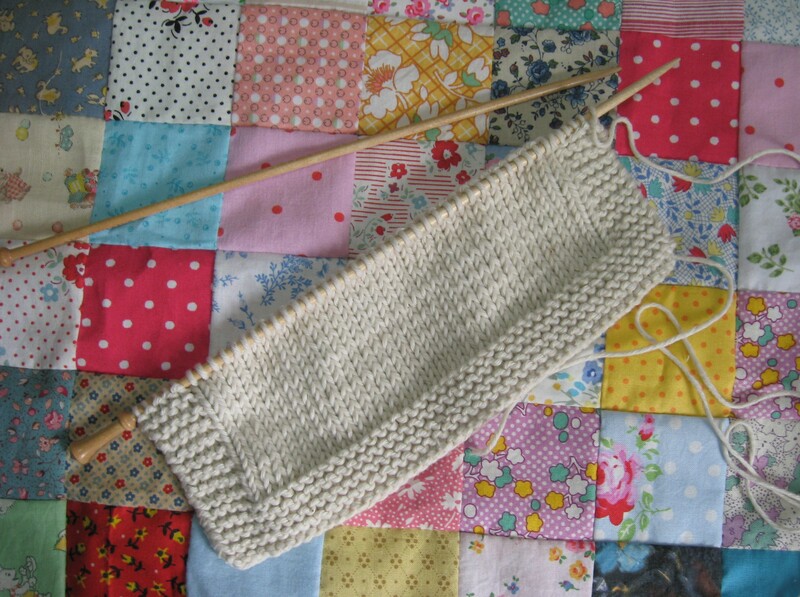 I know it seems daft to knit dish cloths but I’m not a very confident knitter so knitting these helps me practice my stitches even though I know I am very very slow and I dread to think how long it would take me to knit up anything more substantial. I’d knitted just up to the motif then had forgotten about it but while writing out the answers and questions for the Liebster award nomination (thank you again Zeens and Roger) I remembered it and thought how that jumper will only ever remain a dream unless if I practice more. Anyway, this is a pretty simple tutorial for a dish cloth that I’m sure will help to make washing dishes that much less of a chore. It’s a mix of garter stitch, stocking stitch and moss stitch in the middle. At this point you’ve just made your bottom edge of garter stitch. We now need to create an edge of garter stitch on the sides, so the central piece of the dish cloth is knitted in a lovely smooth stocking stitch. Row 13. 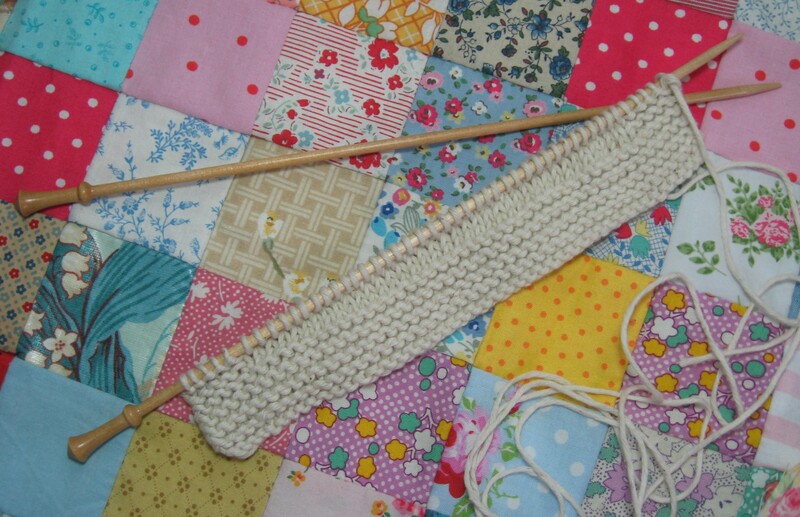 Repeat Row 11 ….. continue repeating alternate rows until you finish Row 26. 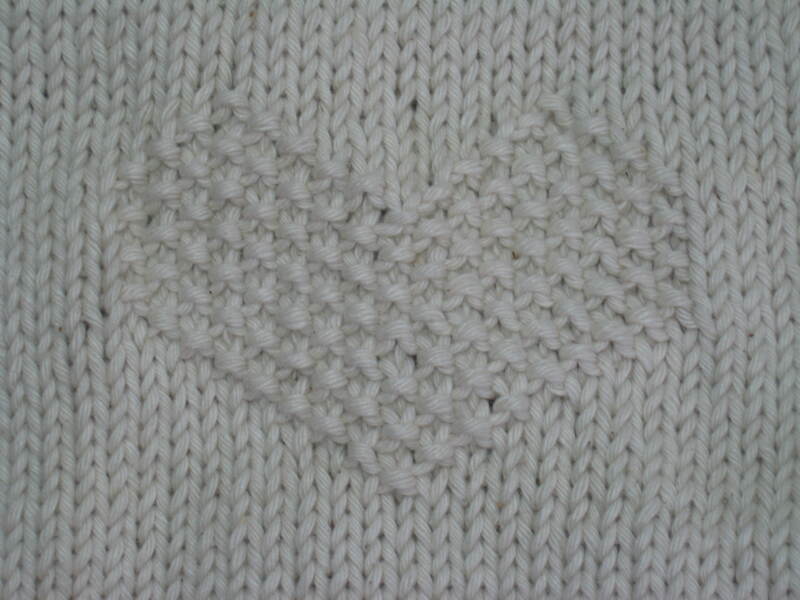 You should now have a lumpy and bumpy Moss Stitch heart surrounded on the bottoms and sides by stocking stitch. All that is left is for you to sew your ends in neatly. 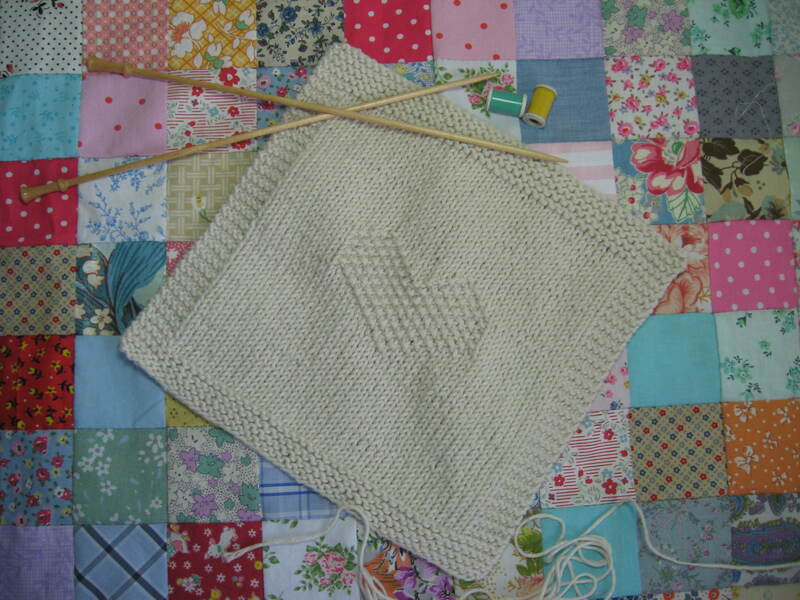 If the dish cloth is a gift then it is nice to block it so it looks really square but if you are making it for yourself then I wouldn’t really worry about doing this.